The new Levante III launched at this week’s Coach and Bus UK show by Caetano is one of the most innovative coaches of the year. 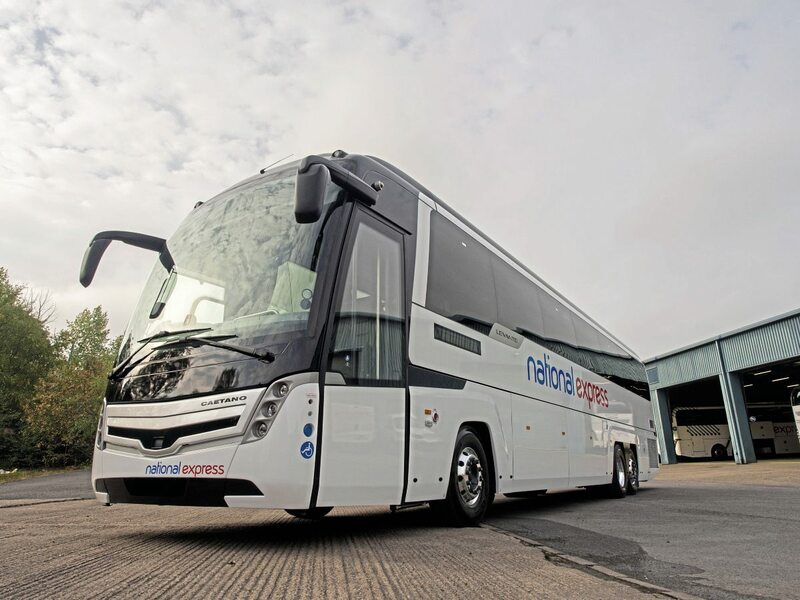 The Portuguese-built vehicle is completely re-engineered and has a raft of new features designed in conjunction with National Express, whose operators will be the main customers for the 14.9-metre tri-axle. Based on Volvo’s B11R chassis, the Levante III has been redesigned in a project which began in 2015, alongside development of Salvador Caetano’s new double-deck under ‘safe and light’ principles – incorporating the latest driver and passenger aids, but reducing the weight impact. 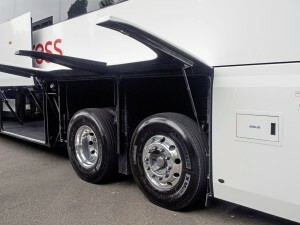 Retaining only the Levante ‘smile’ styling cues at the front from its predecessor, the coach has a squarer front with raised roof pod for its Eberspacher air conditioning, redesigned rear which is claimed to significantly reduce drag, and contouring over the squared wheel arches front and rear. At the front, the driving lamps previously mounted in the front valance have been relocated higher, in the front quarters. The window line changes radically, the down-curve replaced with a more angular styling incorporating the Levante badge just behind the B pillar. At the rear, the rounded top edge is now a lipped overhang over the rear screen and a bold, louvred engine cover sitting between the lighting clusters. To improve engineer access and driver access to the screenwash bottle, the front quarters containing the lighting clusters are hinged at the bottom and latched to drop down, ‘Transformers’ style, while the central panel raises on gas struts to fully open the area for inspection. New, lightweight wheelarch covers are hinged at the top, again on gas struts, and the wheelarches themselves fully sealed to prevent spray reaching any mechanical or electrical components. But much of the real innovation is under its skin. The new Levante has 59 seats plus courier on a single-level ‘theatre’ floor. 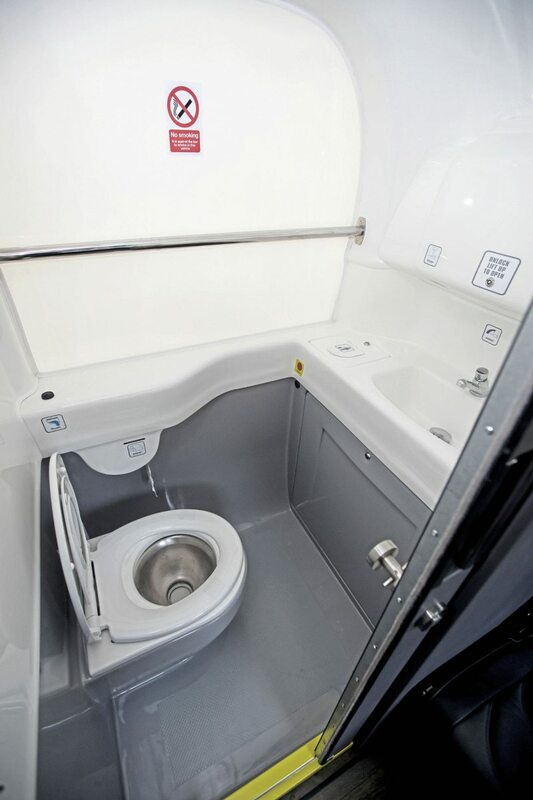 The window depth has been increased to make the window line near the front seats less claustrophobic for passengers, and a new, more spacious toilet has been fitted at floor level, just behind the offside emergency door. 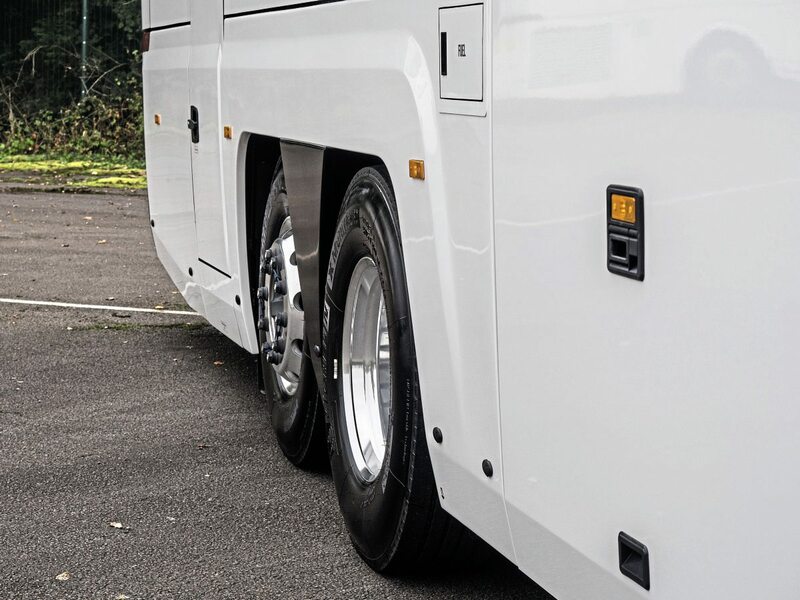 To reduce weight and improve saloon heating control, Caetano has dispensed with water-filled convectors and instead created a zoned, electrical underfloor heating system, which can be controlled for each side of the coach and at the front, and is integrated with the air conditioning. 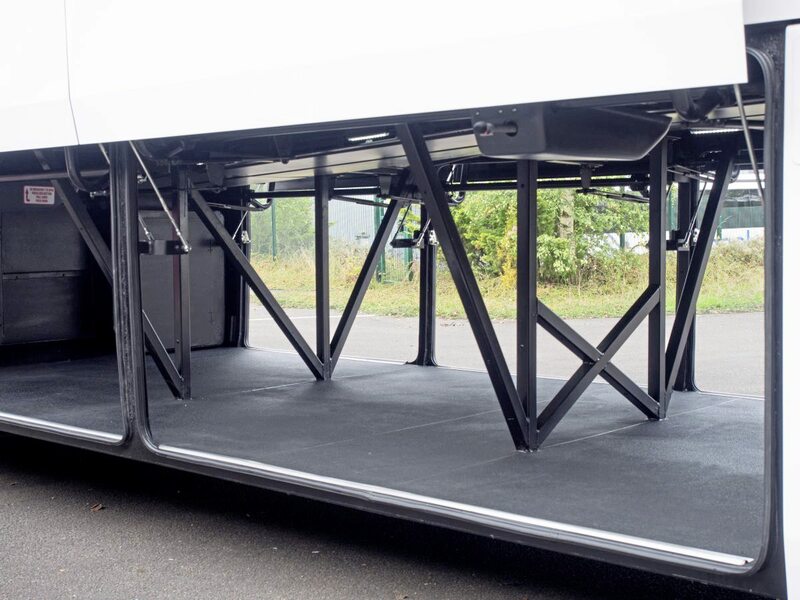 It eliminates the ‘one hot foot’ syndrome caused by side-mounted convectors, can ensure the side of the coach in shade feels as warm as that in the sun, and significantly reduces weight and maintenance issues. New service units have been designed for the luggage racks – themselves aircraft style – and the vehicle uses LED lighting throughout. 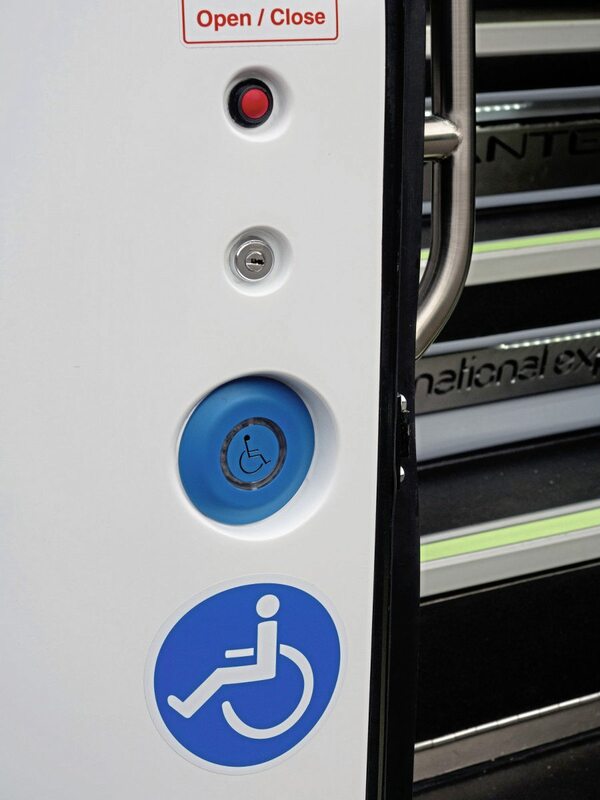 The attendant alert light is now on a push button, and when the coach is restarted, reset so the driver does not have to switch them off. Caetano was the first manufacturer in any automotive sector, including cars, to provide LED headlamps. Additionally, Caetano has installed luminescent strips in the floor, which activate if any of the emergency systems are in operation, directing passengers to the emergency exits, plane-style. The seating has been completely redesigned, using Politechnica seats trimmed in leather, with less aggressive seatbelt recoil mechanism. 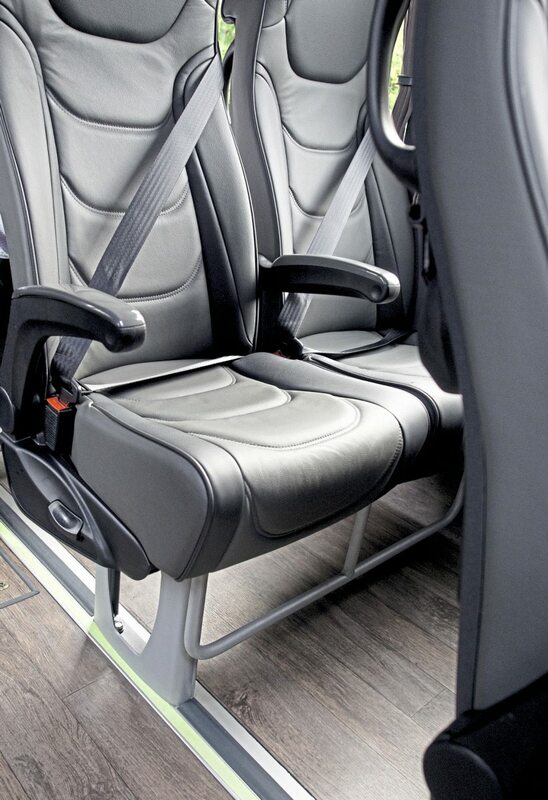 Footrests have been dispensed with, the Levante III instead having luggage restraining rails under them, so that passengers can have laptop bags and the like at their feet, aircraft style, confident they won’t slide forward when the driver brakes. 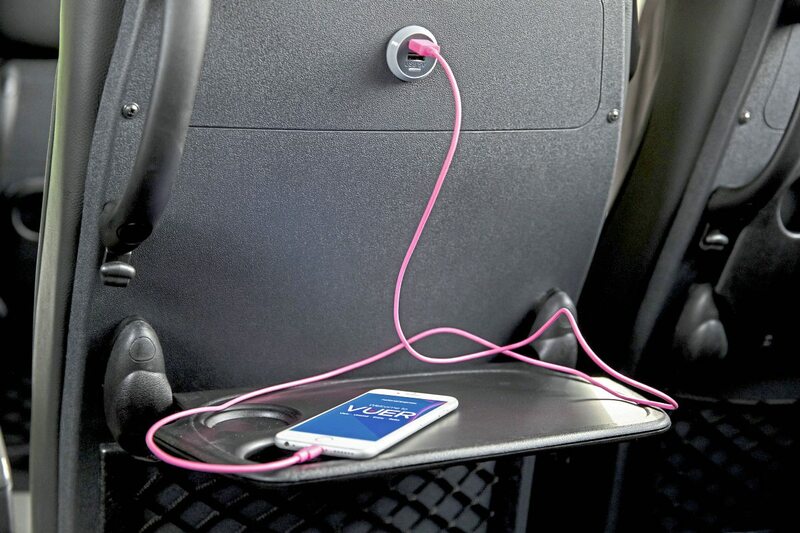 Each seat has two USB sockets, reacting to customer demand, and the 240V plugs are deleted. The courier seat has also been revised. When double-manned, co-drivers complained that their feet, hanging over the stairwell, became uncomfortable. Levante III has an automatic footplate which stows within the top step. The wheelchair lift stows inside the bottom step. When deployed, the wheelchair lift raises the wheelchair to floor height, the platform resting on a box next to the driver which doubles as stowage and incorporates the emergency battery shut-off. The toilet, floor-mounted on the offside, is new. It replaces the plastic composite pan with a stainless one, and is bigger than any toilet unit currently fitted to coaches. Caetano recognised the problem of passengers seated next to the toilet catching a whiff of it, so has negatively pressured the waste tank so air always travels down into the pan when the valve is open, and a PIR sensor which detects a passenger using the loo, boosts the extraction fan very significantly, to ensure the flow of air is always from the saloon into the toilet cubicle. 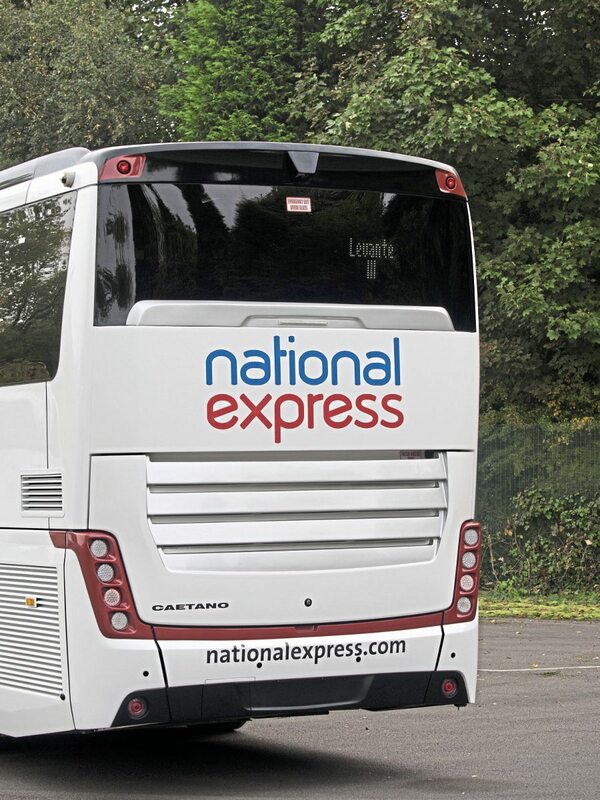 National Express was also aware of the outswinging toilet door, which had a tendency to inconvenience adjacent seated passengers. It has created a sliding, soft-close door which, when the toilet in not occupied, will not slide open when the vehicle brakes. The toilet cubicle is three times the size of a typical stairwell cubicle. Nonetheless, it can be simply dismantled for repair, all components designed so they can be removed through the adjacent emergency door. The emergency door has the latch placed high, and doesn’t open above 5kph. When open, the door deploys steps built underneath it. Roof hatches are now larger, anticipating C&U regulations due soon. For wheelchair occupants, Caetano has revised the nearside wheelchair space to make it larger, still with restraints from NMI, a long-time partner with the builder. 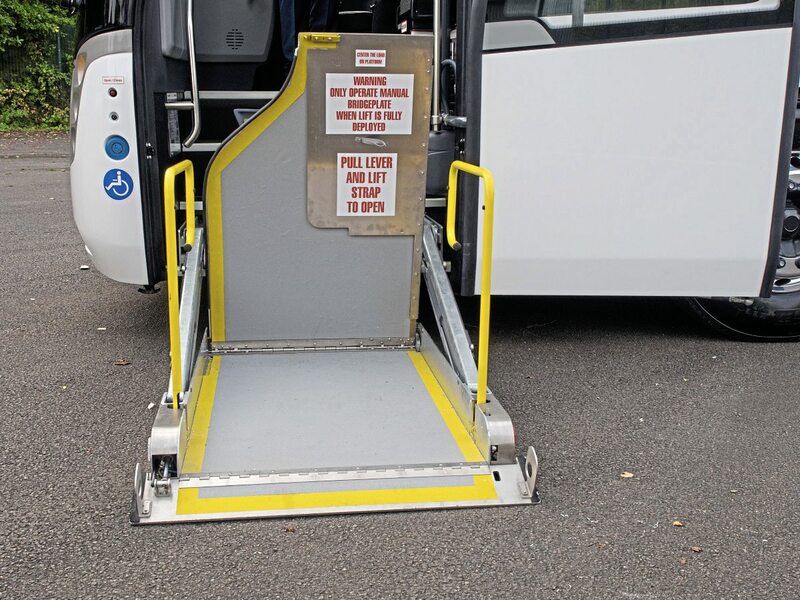 The wheelchair space does not require complete removal of the nearside seats, which can be modified by the driver. 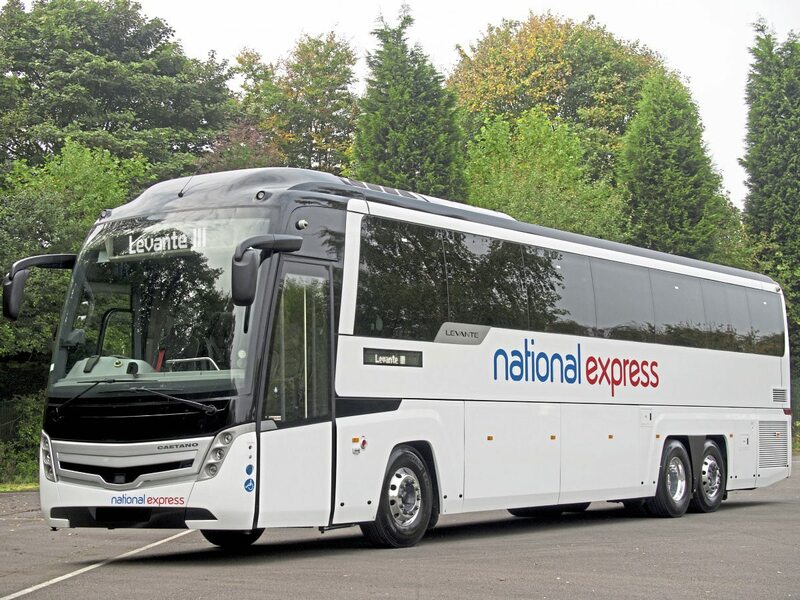 National Express has placed special emphasis on the driver, equipping the coach with a large number of driving aids. In addition to Lane Departure Warning and Collision Avoidance Braking, the B11R has Volvo Dynamic Steering – a system which sits between the steering box and wheel and automatically compensates for steering effects caused by uneven and potholed road surfaces, seamlessly correcting the steering direction and reducing road-induced steering feedback. 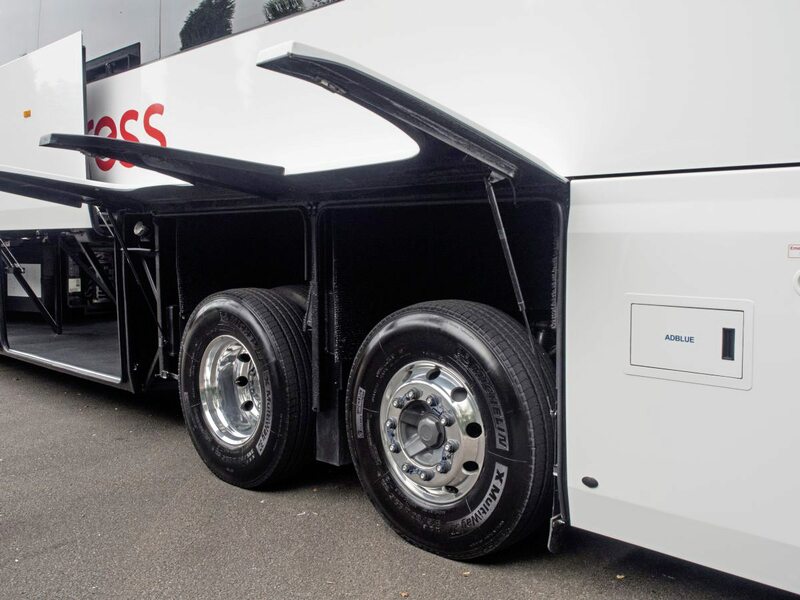 At the rear of this tri-axle, slow maneouvres are aided by Volvo’s active tag axle, hydraulically powered to aid tight turning and reduce tyre wear. The dashboard is new, offering an ergonomic design to place switchgear used most often in the most accessible position. The windscreen features UVB filtering to reduce radiant heat on the driver, and between the glass passenger screen behind the driver, the Levante retains the lift-up concertina blind for night-time driving without unhelpful light from the saloon. Though the Levante III retains the Traffilog telematics system of the current model, it adds Lytx DriveCam – a system which monitors all G-force incidents with cameras facing forward and facing the driver. 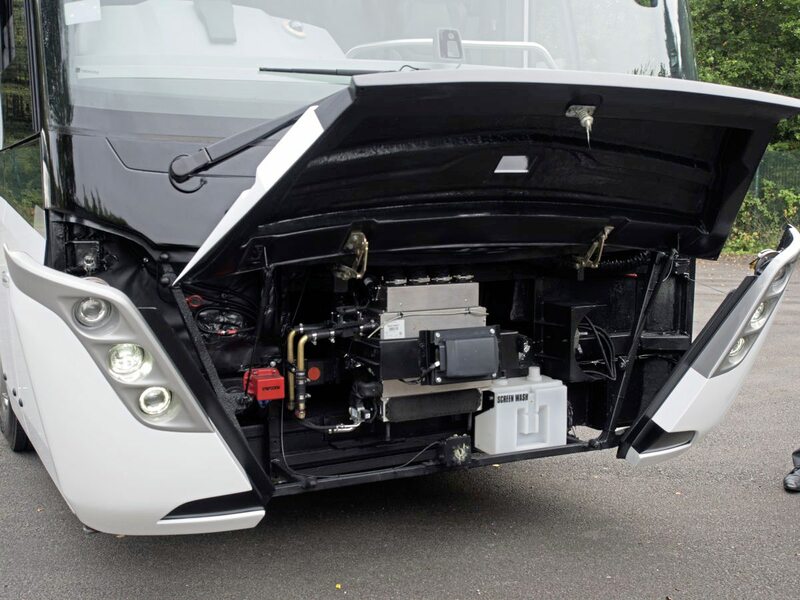 When G-force incidents trigger the system, it automatically uploads both images to the operator, allowing the incident to be analysed and for the operator to discuss and score driver reaction to the incident, either remotely direct to the coach or at the operating centre. 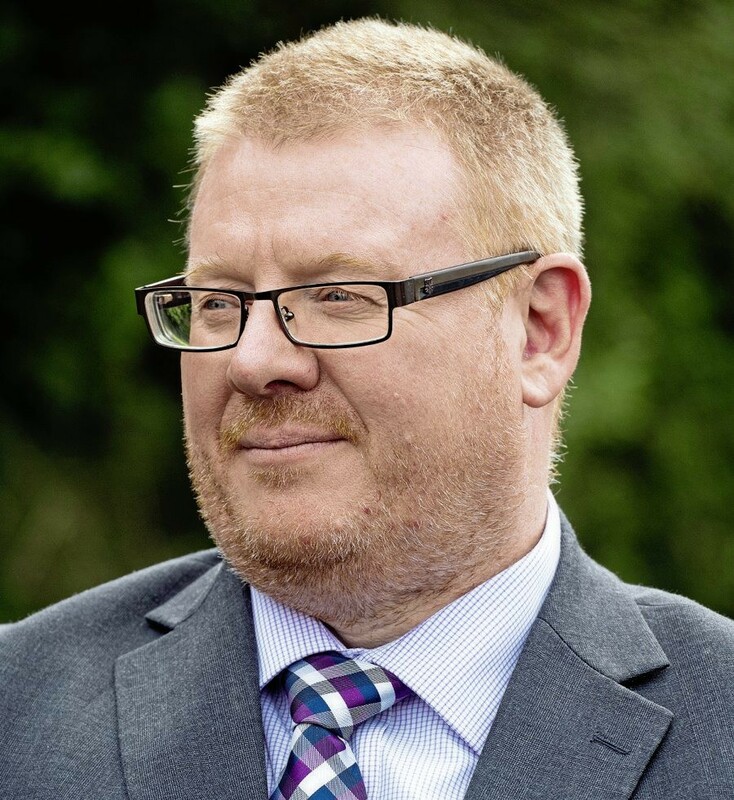 It also provides a safety net for vexatious claims by third parties. The Levante III has a ten-channel CCTV system. The rear camera in the previous model was exposed to road film and needed frequent cleaning. Now tucked beneath the upper ‘lip’ of the coach roof, it offers a better view. Luggage access has been hugely improved, with remotely-operated locker doors on the nearside revealing a very large, unobstructed locker. All components including electrical panels and fuse boxes have been moved to the front locker bulkhead with service doors, and other obstructions have been moved to give a completely clear area. Our challenge was to keep the increase in weight under 200kg despite the extra length, and we have achieved that. 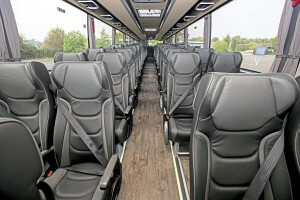 The savings have been made using lighter materials and intelligent engineering, and using these techniques, we have even managed to move from 56 seats in Levante II, to 59 in Levante III. With this vehicle, we have tried to make iterate changes which reflect passenger, operator and driver needs. It’s a constant loop of improvement. 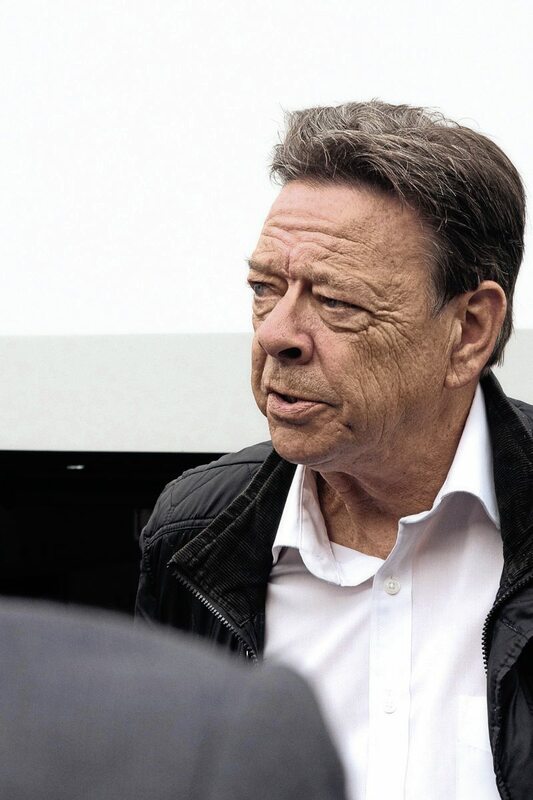 It’s been important to mitigate against increasing weight but we are committed to safety, with improvements for the driver as well. We’re in the business of moving people safely and economically. 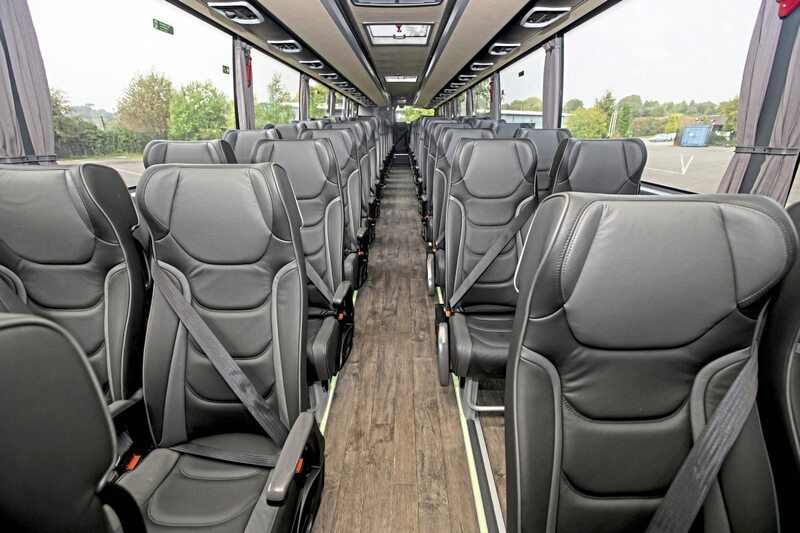 This coach will travel as much as 325,000km per year. 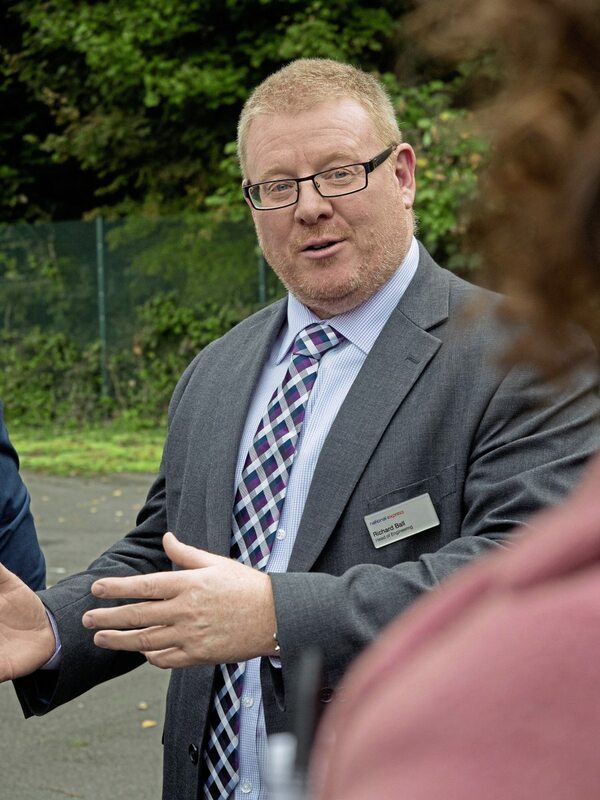 It’s hard work and mammoth mileage – a year on National Express work is equivalent to three years for most other operation. So it is engineered not just as the vehicle we run, but for the next user. 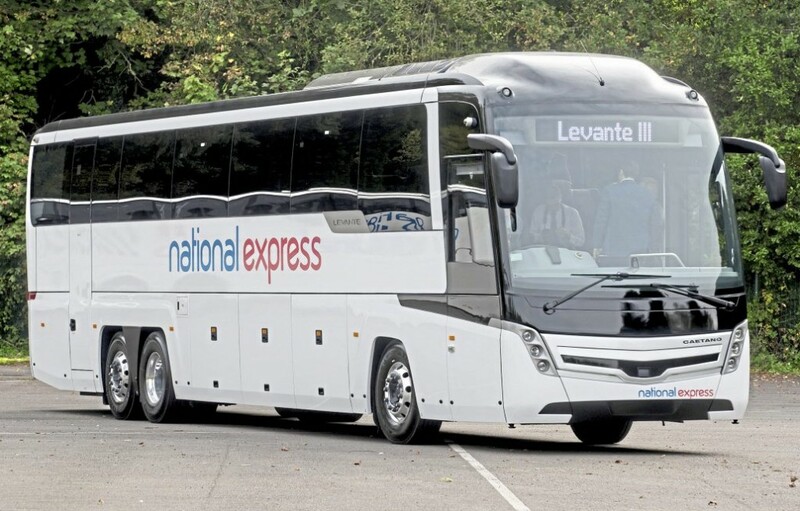 National Express has long concentrated effort on ensuring Levante has good potential for a second life, with most operators taking them off express work at between five and seven years. Continuing this policy, National Express has ensured there is no permanent branding on the vehicle, and Caetano has engineered the interior so it can be reconfigured at minimal cost, using off-the-shelf components, when the Levante III heads for its second ownership. Even homologation in these new configurations has already been done. With a second life in mind, Caetano has built all body framing below the waist rail from stainless steel. 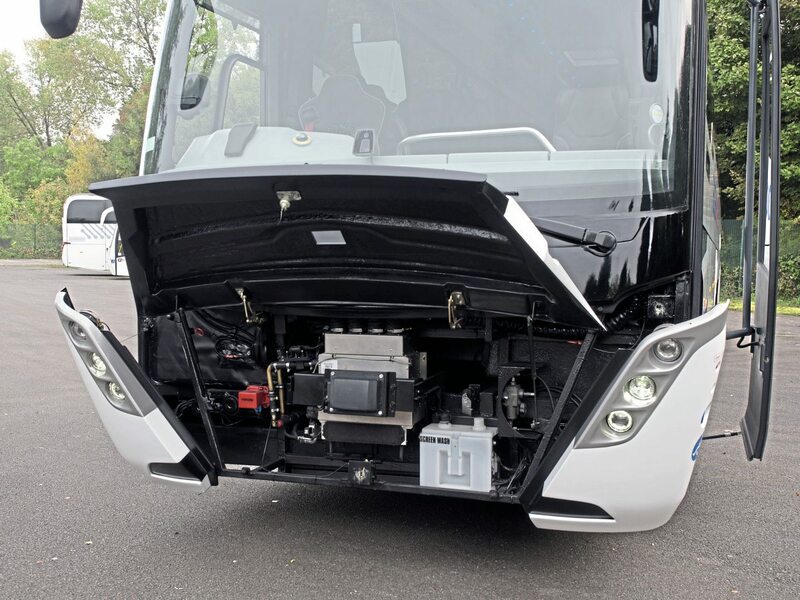 The preview vehicle, which was also at Coach and Bus UK, is a prototype, with Caetano expecting to begin production in the second quarter of 2018, alongside Levante II during the change-over. 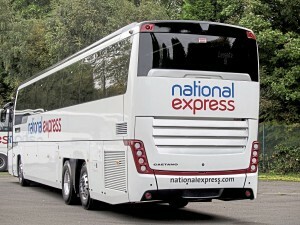 National Express operators take between 80 and 100 new vehicles a year. 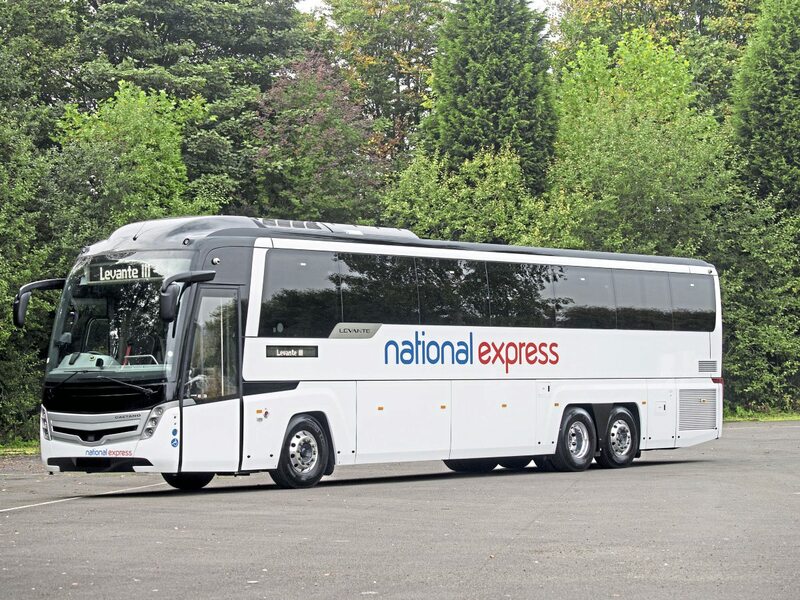 Although the Levante III is built for National Express primarily, it is also available to other operators at an approximate £300,000 price tag. The story of Caetano’s original Levante project is one of persistence and vision, the idea of a front-door accessible coach very nearly killed at its inception. Richard Hunter (left), then Group Sales Director for the Leicestershire-based UK sales outlet for Salvador Caetano, found himself in 2004 pondering why the Portuguese-bodied coaches were not being sold to operators working for National Express, which had a strict specification for its vehicles. 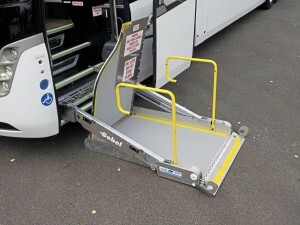 With the new Disability Discrimination Act looming, and demanding wheelchair access to all express coaches, the only solution at the time was a wheelchair lift mounted at a centre door; impractical for infrastructure (in particular the chevron parking employed in most coach stations), for operators and for the passenger: “I thought, we’re going to have to get the wheelchair through the front door,” Richard said. Richard says that, in his mind’s eye, he saw a ‘normal’ coach wheelchair lift – which has more travel upwards than downwards – in reverse, so that it would have more ‘drop’ than lift, extending out of the coach passenger door, and able to bring the wheelchair platform up to floor height. “The factory in Portugal supplied some theoretical drawings and measurements, but we still needed the lift and restraints. Bill gave me a list of all possible manufacturers and I went to a mobility exhibition to talk to them. One by one, they turned me down. PLS was too busy. Technically, the project involved a lot of new engineering in Portugal, widening the door and even extending the steering shaft. It was in Portugal that the phrase ‘magic floor’ came up in conversation, when it was realised that the lift base would be one step short of the floor height and, with PLS, the factory devised a hydraulic scissor lift to get the extra step up. NMI approached the restraint system engineering with great enthusiasm, Ilan Alfassa even resolving a patent issue conflict. But the project was eating into Richard’s time, and this hadn’t escaped the notice of the then Managing Director. 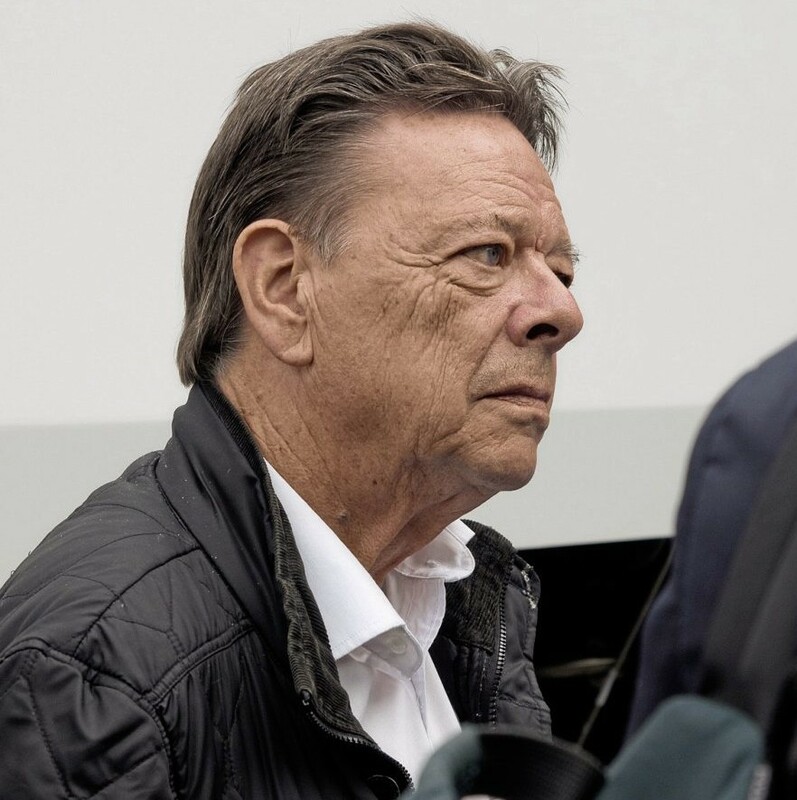 Richard was three days away from being fired, his ‘resignation’ letter, awaiting signature. 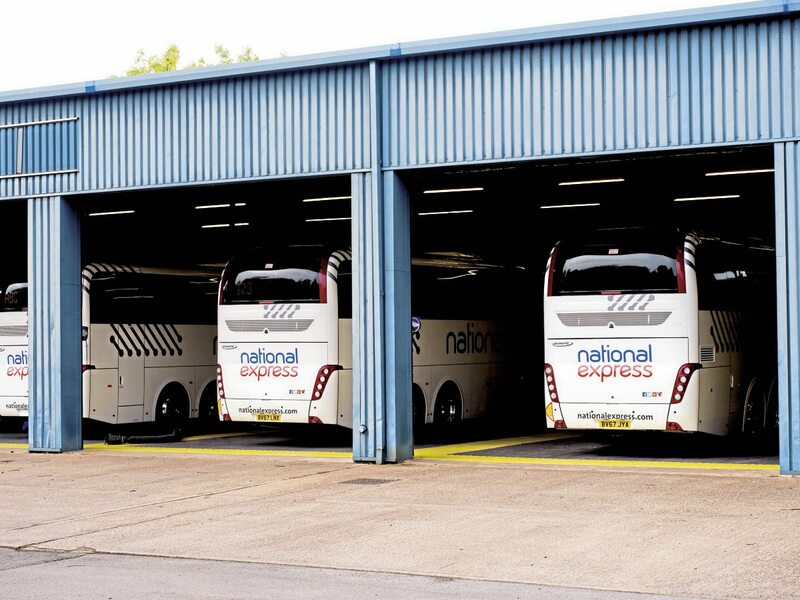 Salvador Caetano has now built almost 920 Levante vehicles for National Express work.